ASCEND INTO THE HOLIDAYS WITH US! Our biggest deals of the year are finally here. Use code: BLK_FRI20 to redeem. Limit 2 packages per customer. 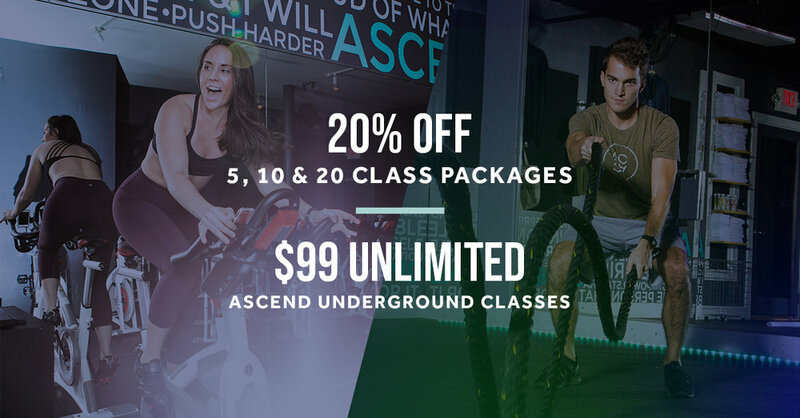 Classes apply to all cycling, Ascend Underground classes and blended formats, such as Ride + Abs & Glutes. Expiration dates and terms & conditions apply. Need more Ascend Underground in your life? Grab this limited time offer and lock in an amazing rate for unlimited classes. This membership includes unlimited access to all of our Ascend Underground classes, plus our monthly workshops, such as Roll & Restore. Contract renews for 3 months. Terms & conditions apply. Get 20% off when you purchase a gift card for any 5, 10 or 20 class package. Email us to purchase your gifts!